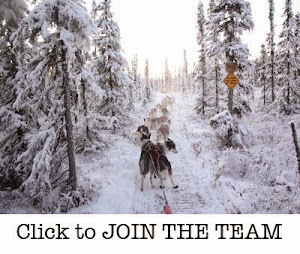 I started the race Friday morning with the nine dogs I thought were most solid: Ruby, Kozy, Major, Victor, Doc, Linnea, Daphne & Frigg, plus Papas, who is usually lazy and came just to fill out the team. 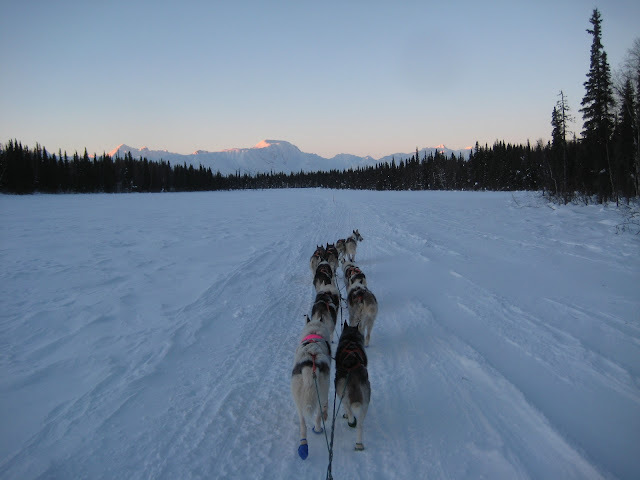 Due to poor weather in January, we came into the race fairly undertrained, but I ran a very conservative schedule and the dogs paced themselves well. They were slow, but steady, with the same run times coming and going. It was a fantastic weekend to be out with the dogs. Clear, sunny skies during the day, with a full moon lighting our night runs. Friday night we got a treat: the northern lights flared up green and strong, shimmering over the Skwentna River. We traveled alone for most of the course, no headlights in sight ahead or behind; very peaceful. 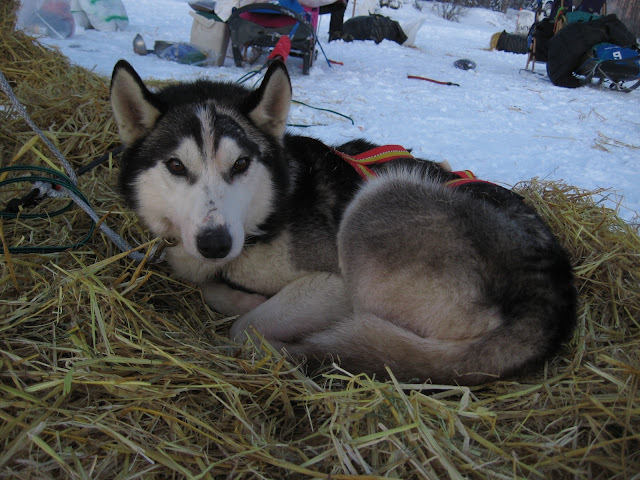 I broke the race down into six legs with plans to feed and rest at each stop: (1) Deshka to Yentna (2) Yentna to Skwentna (3) Skwentna to Finger Lake (4) Finger Lake to Skwentna (5) Skwentna to Yentna (6) Yentna to Big Lake. 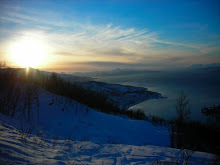 The first run to Yentna was way faster than expected-- hours faster. 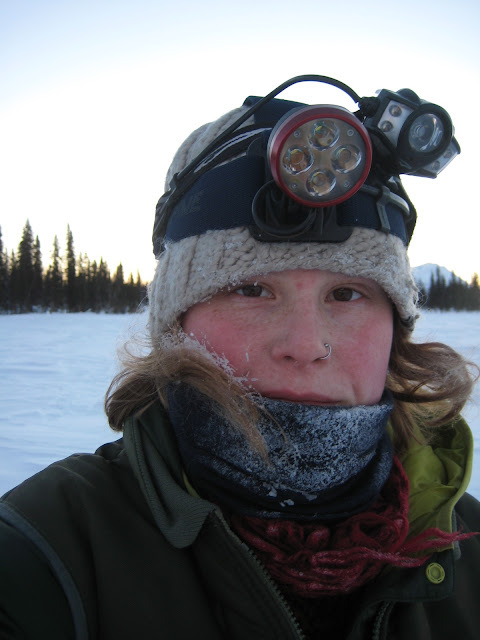 Other mushers using GPS estimated the trail to be just under 40 miles rather than the 50 we had been expecting. No matter.. I was sticking to my schedule so this just meant more rest for my dogs. We stayed at the first checkpoint about five hours. 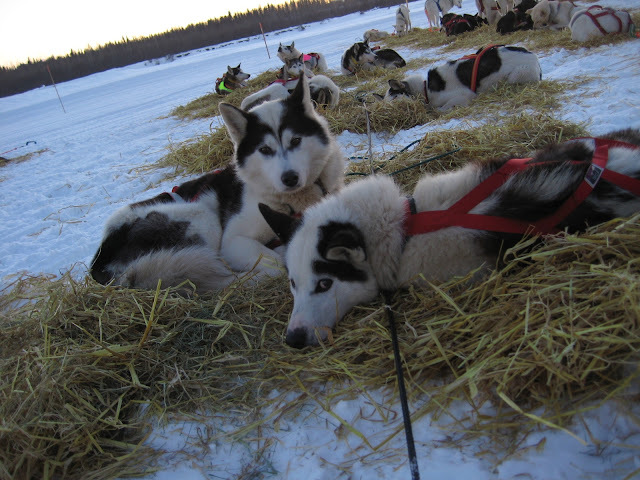 It was fun to be parked amid so many other mushers. 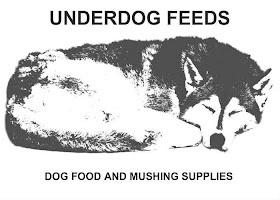 The sun was shining, mushers were buzzing around cooking meals & chatting. High spirits everywhere. 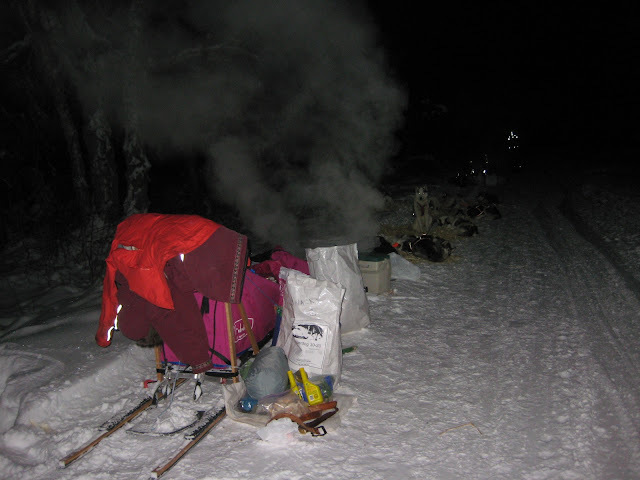 This was the one time during the race all the mushers were camped at the same time. The dogs wolfed down their meals and settled into their straw and I set about changing my runner plastic. This proved to be more time-consuming than I anticipated. My runners were iced up from overflow and I was struggling to get my new plastic on. Vern Halter walked by on his way to the roadhouse and stopped to give me the most helpful tip... pour Heet on the runners. Heet's main purpose is to absorb water, so it ate up all the ice, giving me a clean runner that was ridiculously easy to slide the plastic on. Mission accomplished. Vern told me later this was something Rick Swenson had once shown him at a checkpoint. I headed inside the roadhouse hungry for a mushroom swiss cheeseburger and some coffee. I was very appreciative of Vern, Martin Buser, and Timmy Osmar, all of whom gave me sound advice at Yentna concerning my feeding and run/rest schedule. It was nice to sit and talk to Lev and Angie too.. as that was basically the last I saw of them outside of passing hellos leaving checkpoints. Lev ran a great race that placed him several hours ahead of me, so the next time I saw him was when I met him on his way out of Finger Lake, 75 miles up the trail. Yentna was the furthest upriver I'd ever been with the dogs, so the next two legs to Skwentna and Finger Lake were new to me. The thirty something miles to Skwentna were river miles. I was surprised at how many lodges and cabins lined the river; we were definitely not in the middle of "nowhere." Travel by dog team provides a unique perspective of landscape. This really came into focus for me after the race, when I asked my uncle to pick up my drop bags at Yentna. For me, Yentna is a small journey... a few hours of river travel away. So when he said, "ok, we'll be back in about an hour," my head spun. For him and his snowmachine, it's just a half hour zip away...! 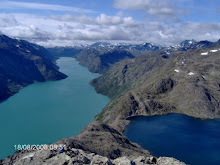 When we reached Skwentna, I was uncertain where I should camp. We had been advised not to camp along the stretch between Skwentna and Shell Lake, but I had no idea where that stretch actually started. The trail clearly took a turn off the river and into the woods, and I wavered a minute or two about whether I or not I should go on or camp right there on the edge of the river. I didn't want to head into the "no camping zone" and have to turn around but I didn't want to camp in the open on the river either. I decided to go ahead and followed the trail off the river, around a sharp left turn and onto... a big wide road with recently groomed shoulders. This was clearly where the race organizers intended those of us who planned to stop in Skwentna to camp. 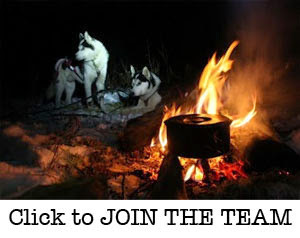 I stopped, lined out the dogs, snacked, got the cooker going and strawed the dogs down. The dogs again ate like monsters. 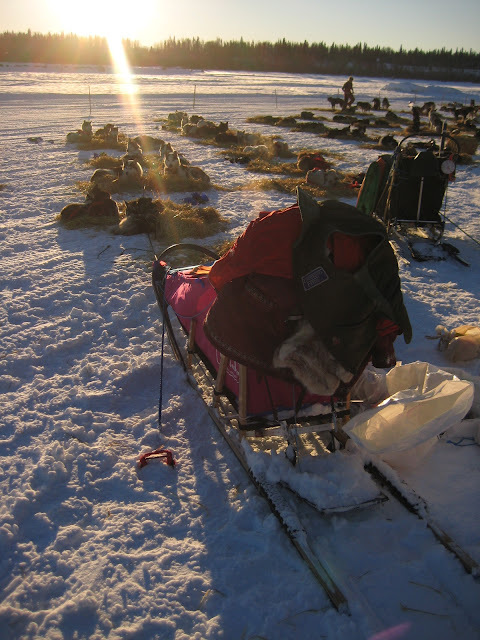 After I packed my sled, I stretched out next to Linnea and we all settled down for a short nap. An hour or two later I woke up to my alarm. I lay still in my sleeping bag, looking up at the stars burning in the night sky and listening to the quiet of the night. After a moment, I unzipped my bag and started getting ready for the next leg. Shoes on, jacket zipped, hat adjusted, booties located. After about four hours of rest, I pulled the hook in the early hours of Saturday morning and we headed off towards Finger Lake. 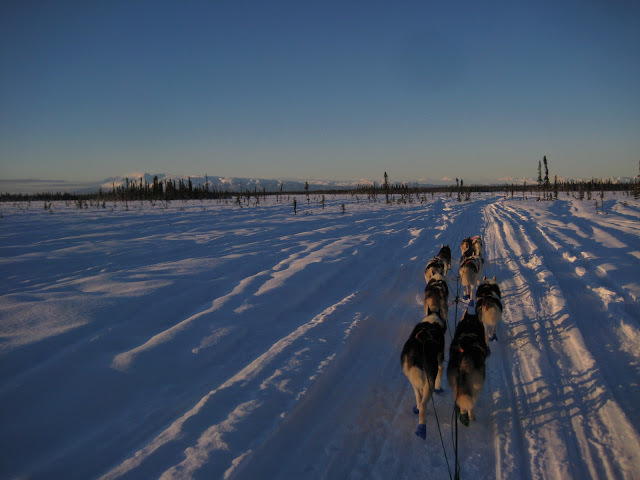 The trail navigates Skwentna's small road system and spills onto a gigantic swamp nestled at the base of the Shell Hills, with the Alaska Range just beyond. This part of the trail was a highlight of the race for me. 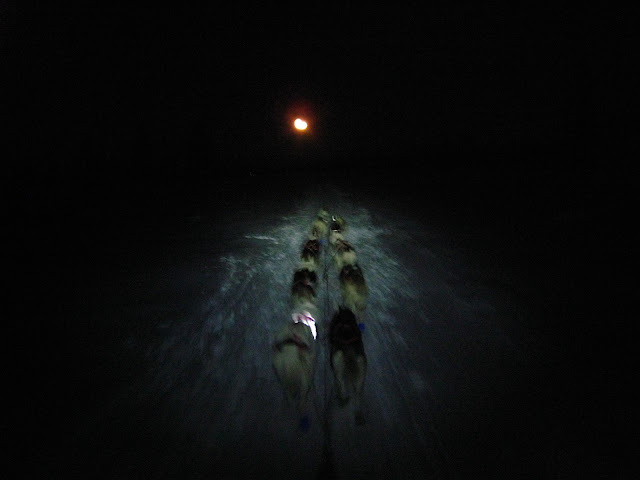 The trail was super nice, the moon fat and white above, and the dogs were cruising... This was also the part of the trail we were required to have our headlights on 24/7--to make ourselves visible for snowmachines-- but it was so bright out, so still, I couldn't resist the moonlight running and--Don't tell Sue!-- I switched my light off. I did keep the red LED bike blinker on my sled going... It was on the stanchion, just out of sight of my peripheral vision, so it didn't spoil my moonlight time:) I felt safe enough. There was no way a snowmachine could roar through that wide, wide, open swamp, even going 100 mph, without notice and time to switch Wilma back on. And it was lovely. Sailing along smooth trail in the dark... feels like flying. The headlight came back on once we reached the base of the Shell Hills. Into the shadows we climbed. The trail narrowed as we wound our way up into the foothills of the Alaska Range. Lots of twists and short, steep hills. It was still dark when we dropped down onto Shell Lake. The trail cut straight across the lake toward the light of a large cabin. As we headed up the steep bank to the cabin, a race volunteer popped out of the cabin, asked for my bib number and informed me it was 20 miles to Finger Lake. The trail literally went right though the front yard, past a wood shed, and up into the hills behind the cabin. Victor, up in lead with Ruby, took a small detour... into the wood shed. It happened so fast, most of the team was in the wood shed before I knew it. I don't know what he was thinking, but it didn't take much time to haul him out of the wood shed and back onto the trail. We climbed further into the hills and soon the trail took on a familiar pattern: woods, meadow, woods, meadow, woods, meadow, etc. 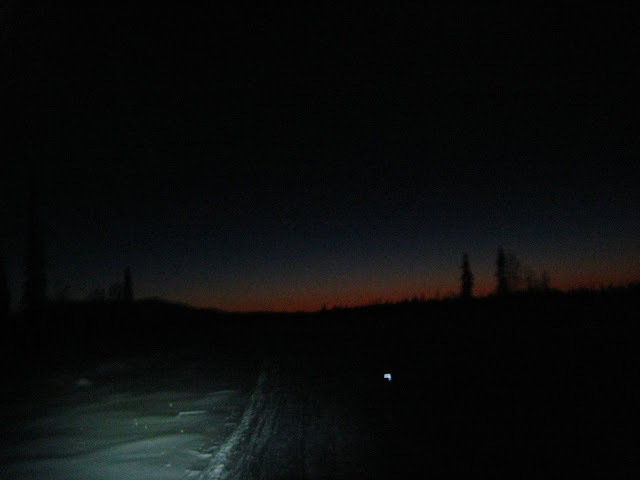 As daylight brightened the horizon, I spotted a headlight ahead of me. It was Frank Habermann, running Tim Osmar's dogs. He said he was having trouble getting his dogs to focus; girls in heat, apparently. I passed him and he followed me the last couple hours to Finger Lake. 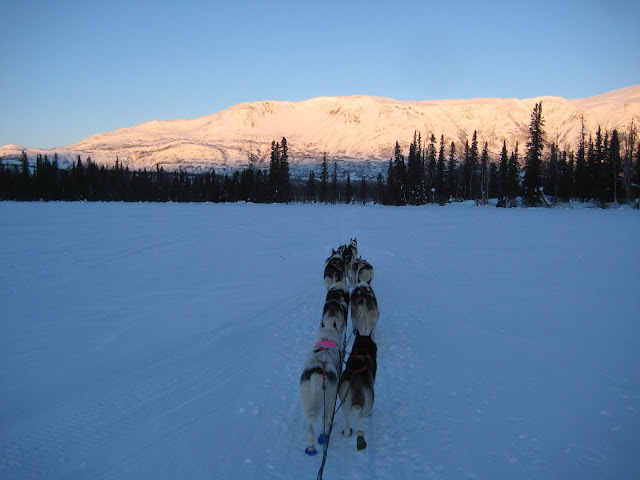 When we hit the lake to the checkpoint, the dogs picked it up and we flew into the checkpoint. I was so proud & happy to be there I thought I would burst. Timmy Osmar was there to ask how my run had gone.. Good, uneventful, I said. What more could you ask for? he said. A little speed, I joked. And he said something that stayed with me the rest of the race: "Well, you know.. forward is fast." Or maybe he said "fast is forward," I don't know, but it turned into a mantra I reflected on for the rest of the race. 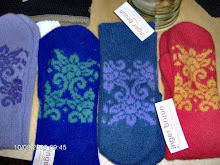 Coming soon: Part II-- Finger Lake and Back Again. Willow swamp with Sleeping Lady in the distance. Frigg & Doc with Major conked out right behind them. Sweet Papas who worked so hard, completely surprising me. Camp at Skwentna. That's Doc sitting up watching the cooker steam. A poor representation of full moon running. I think I wanted to see if I looked as tired as I felt. ha!